Oh yeah! I sure am in a jolly mood. For lots of people in the workforce, they like to use #TGIF every Friday. Although there’s pretty much a lot of other workers out there (and freelancers like myself) that the #TGIF tag doesn’t always apply to. This is either because their jobs extend throughout the week or because gigs come up any day & time of the week. If you work at such a place, where you don’t have your weekends or public holidays to yourself don’t be sad :). You can have fun all the same 😊 I mean, why should we limit ourselves to days we can or cannot have fun huh? Remember when we were little? There was always this long list of things that could easily turn our gloomy moments to happy ones. e.g. biscuits, sweets (others call it candy. I especially loved gon-gon… That’s M&Ms in Nigerian children language, if there’s any term like that 😋) and so many other cool stuffs like toy car racing, skipping ropes, play acting, watching TV, dancing etc. Like I said the list is endless. Sadly though, this list somehow grows shorter and shorter as we grow old. We tend to take almost everything too serious and forget to have fun. When was the last time you tickled someone just for the fun of it. Or when last did you dance and hum to music just ’cause you feel like. Psst… *whispers* I sometimes wink and smile at strangers. Lol! That’s weird right? But it makes people stop and smile for a minute or two. That’s probably the total sum of smiling that person gets to do throughout that day. So, because this life we’ve got is oh so precious 😍 and smiling, turning up responsibly & generally being happy helps make it interesting, there’s this amazing movement I want you guys (and ladies & adorable kids) to join 😊 It’s tagged Spot The Difference. Describing this in my own terms, I’d simply say it means we should BE the difference. 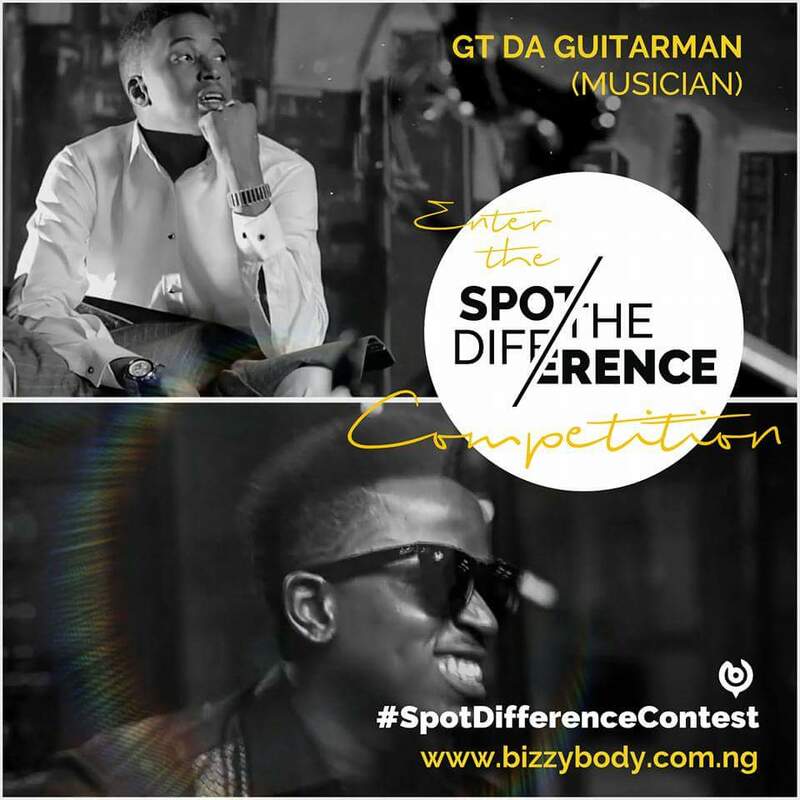 The organisers of this initiative (BizzyBody NG) have put up a competition to encourage people to defy the gloomy norm and BE happy! What’s more fun than winning awesome prices for simply being happy. How to participate in Spot The Difference? Take 2 pictures or videos of yourself. One (1) of the pictures or videos should depict your BORED self while the other should show your GROOVY self. 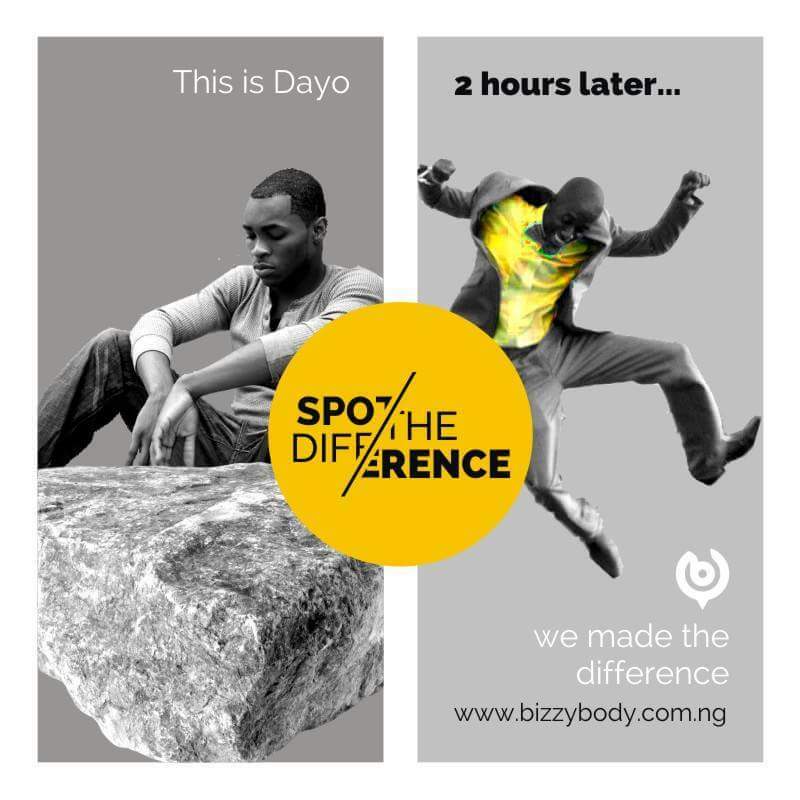 The BizzyBody crew will repost your image on their Instagram timeline and then you can ask your friends and loved ones to go like the re-posted picture/video of you Spotting The Difference on @BizzyBodyNG IG (instagram) timeline. Voting will be done by inviting your friends to ‘LIKE’ your own image or video on @BizzyBodyNG instagram timeline only. 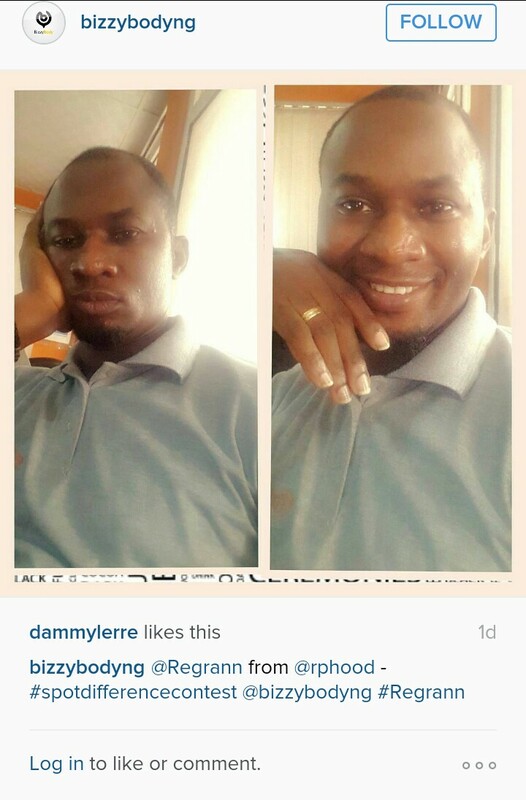 Voting is STRICTLY on @BizzyBodyNG instagram timeline. – Winners will be announced on February 27. – Other Prices of Air time Recharge vouchers may be won during the competition too. So come on friends! Let’s Spot The Difference!! Don’t forget, deadline for submissions is FEBRUARY 26. Till we meet again! BE Happy and STAY Happy! !